Airtherm Engineering Limited has completed a supply and installation of multiple kitchen ventilation hoods at a well-known private School in Edgbaston, Birmingham. The main island canopy is sized at 9.0m x 3.0m, designed with a slope to feature the existing 1950s glass construction style. 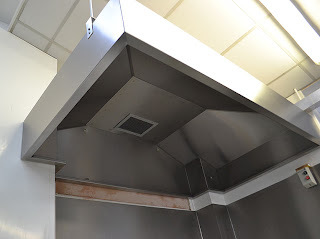 We have also supplied and install various other wall mounted stainless steel extract hoods connecting onto the existing ductwork arrangement. 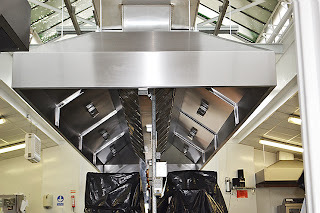 We were given just 4 days to remove the existing hoods and install the new stainless steel kitchen canopies, and remarkably this was achieved by shear hard work from our on-site engineers. Our Canopies are cut, punched and folded into sub sections and factory assembled by means of computer controlled seam welds, and non-visible mechanical fixings. Systems are manufactured to the strict guidelines of DW/172, British Standards and conform to HSE for commercial kitchen ventilation. Wall mounted or island canopies can be manufactured to meet almost any dimension but typically 1000mm to 8000mm long. The system ductwork is manufactured and installed to incorporate cleaning and maintenance access doors to fully comply with DW/144 standards. All of our canopy systems are manufactured to the strict guidelines of DW/172, British Standards and conform to HSE for kitchen ventilation systems. All canopies and associated components are thoroughly tested to ensure high standards to meet with our clients expectations. Our lighting units are sealed to industry standards to prevent the ingress of moisture, grease or heat. They meet all necessary hygiene and safety requirements. Our control panels are designed to meet our clients demands and system features available include gas detection and shut-offs, C0 and C02 detectors and fire suppression systems with a link to the building alarm system.